Jack's PACT evolved from a memorial scholarship fund established for Jack Pearsall, a 16-year-old Falmouth boy who was hit and killed by a drunk driver in July 2011 as he was leaving a fireworks display at Mashpee High School with friends. He passed away on July 4th due to those injuries. 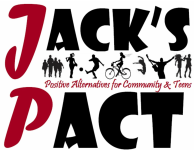 Today Jack's PACT is a grassroots community group, scholarship fund, and anti-drunk driving campaign that includes dozens of youth and adults. Jack's PACT is under the umbrella of the local non-profit organization called Falmouth Together We Can, Inc.
Our mission is to support existing initiatives and develop our own that deter drunk driving and other risky behaviors surrounding substance abuse in our community, while promoting healthy, positive lifestyles. To accomplish this, the PACT supports engaging pro-social activities for youth, education and awareness, and encourages people of all ages to sign our "PACT" pledging not to drive while under the influence of drugs or alcohol. To date, nearly 1,500 individuals, young and old, have made this very important pledge. Are you next to sign? The above documentary and music was produced by Brian Engles of Falmouth, Jack's PACT's Media Representative. If you would like to use this film for educational purposes, we would love to hear from you to add your group to our growing list of organizations, schools, agencies, etc that are using it to teach. Please send Brian an email by clicking HERE.